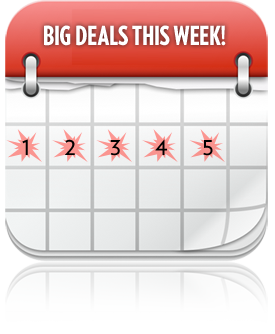 Our members spoke loud and clear: you loved the 6 Deals in 5 days last week. As we have always said we listen when our members speak! So we are going to run another 6 deals in 5 days. Some are the same because they were enjoyed so much while others are new for even more excitement. Check out the full list below! One of our favorite games is Dolphin Cash. This slot is extremely fun and exciting. With it's extra win mode you can unlock multiple bonuses types. The shifting wilds are the best part of this game though. If you land a dolphin on the 5th reel it will shift every spin to the reel to the left. Other bonuses include 12 free games with x3 multipliers. Check this game out and let us know what you think. Deposit 50 and get 60.00, it's that easy. On Saturday Aug 3rd, 2013 from 00:00 GMT until 23:59 GMT, all members are invited to claim a $/£/€60.00 bonus on your first deposit of $/£/€50 or more. You may claim this bonus three times for $/£/€180.00. On Monday August 5th, 2013 from 00:00 GMT until 23:59 GMT all members are able to receive a $/£/€20.00 bonus on any deposit of 10 or more. You can claim this bonus two times for up to $/£/€40.00 in bonuses. Also on Monday August 5th, 2013 from 00:00 GMT until 23:59 GMT all Fly members will earn 10X comp points on all games! 10X's more comp points on every game to go along with the $/£/€10 for $/£/€20.00 bonus. Now that's value! Deposit $/£/€100 (or more) and receive a $/£/€150.00 bonus on Tuesday August 6th 30th, 2013 from 00:00 GMT until 23:59 GMT. So if you deposit $/£/€100 you will have a bankroll of $/£/€300.00 to play with! We don't call it Big Money Tuesday for nothing. On Wednesday August 7th, 2013 from 00:00 GMT until 23:59 GMT on any deposit of $/£/€30 or more you will receive a $/£/€60.00 bonus. That's doubling your money on Wild Wednesday!